Fur trader, explorer, teacher, lawyer. Born in June 1822 at Cumberland House, in present-day Saskatchewan, son of Thomas Isbister, a Hudson’s Bay Company officer and a mixed-blood daughter of Alexander Kennedy and his Cree wife Aggathas. He was educated at St. John’s College in the Red River Settlement, from 1833 to 1837, and in the Orkney Islands. Returning to the North-West from Scotland in 1837 he entered the service of the Hudson’s Bay Company, serving at Norway House, Fort Simpson and Peel’s River. A number of his exploring expeditions were the basis of papers given later to the Royal Geographical Society and the British Association for the Advancement of Science. Isbister was unhappy with the lack of advancement granted to mixed-bloods. Isbister resigned in 1841 and returned to Scotland to complete his education at Aberdeen and Edinburgh universities, receiving his MA degree from the latter in 1858. 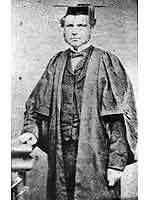 After studying law he was called to the Bar in 1864 and received his L.L.B. degree from the University of London in 1866. He joined the staff of East Islington Proprietary School in 1849, was headmaster in 1851, and moved to a series of more prestigious headmaster appointments (Jews’ College, 1855; Stationers’ Company School, 1858). He became active with the College of Preceptors that oversaw the English teaching profession. He edited its magazine, the Educational Times, and was dean after 1872. Though absent from his native land from 1842, he never lost interest in its well-being. Not surprisingly, he fought hard and long on behalf of his mixed-blood countrymen, whom he regarded as being under the tyranny of the HBC. In 1847 he headed a deputation to the British Government presenting the petition of 1846 from 1,000 settlers of Red River for status as a recognized colony, and in 1857 was called to testify before the House of Commons Committee investigating the Hudson’s Bay Company Territories. He also wrote A Proposal for a New Penal Settlement in the Uninhabited Districts of British North America (1850) and, with A. W. Chesson, The Red River Insurrection: Three Letters and a Narrative of Events (1870). He endowed a schools prize for Red River in 1867 (now awarded by St. John’s College). Throughout his life Isbister was an early advocate of the inclusion of the Company’s territories in Confederation. Always active in the promotion of education he left in his will money for the establishment in Manitoba of the Isbister prizes and scholarships. A trust fund was established for scholars ($100,000, first awarded in 1885) at the University of Manitoba. In addition, he left his extensive collection of nearly 5,000 books to the University of Manitoba. Regrettably, most were lost in a fire in 1898. He died at Islington, London on 28 May 1883. He is commemorated by Isbister Street and Isbister School in Winnipeg, and the Isbister Building at the Fort Garry campus of the University of Manitoba. MHS Transactions Series 3, No. 12, 1955-56 Season. Manitoba Pageant, Vol. 3, No. 1, September 1957. Alexander Kennedy Isbister: A Respectable Critic of the Honourable Company by Barry Cooper (1988). Alexander Kennedy Isbister, Dictionary of Canadian Biography XI, 445-46.